Who needs to carry a mobile phone around when you could wear one on your wrist. We look at the options for mobile phone watches. This phone popped up in the UK in November 2008. This watch is available unlocked for under £250, and is a fully featured mobile phone capable of voice and text, as well as audio and video playback, recording, hands-free calling and a whole host more. Available now, this works will work with all networks in the UK, apart from the 3 network. More on the SWAP Watch? 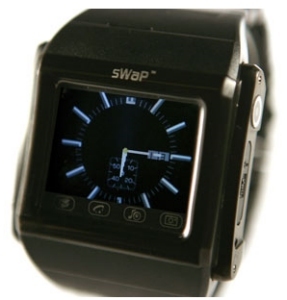 Check out our Podcast SWAP Watch Review. The LG-Gd910 Watchphone appeared in the UK in August 2009, and is available from Orange. The Watchphone connects to the 3G network, has a scratch-resistant touchscreen. There are eight electronic watch face designs available. 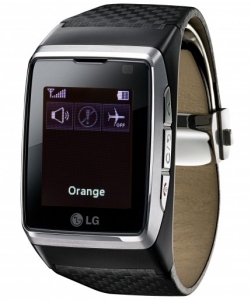 When launched, the LG Watchphone was only available by turning up in person at the Bond Street, London Orange Store. Available online via the Orange Shop for around £500. Got a question about watch phones? Ask in our forum!